Epigenetics is the study of inheritable changes in gene expression not directly coded in our DNA. It appears that our life experiences can be passed on to our children, and to future generations, by this mechanism. 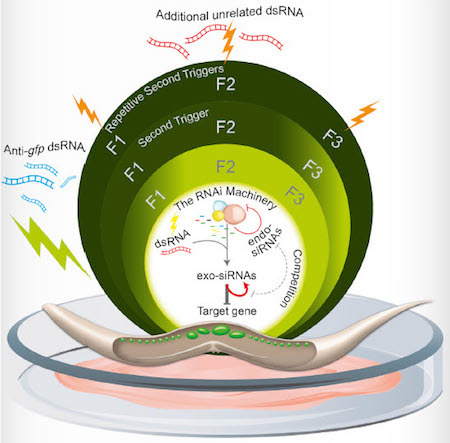 RNAi responses would be memorized or forgotten. The first time I read about this idea was in an excellent series of fantasy novels by Barbara Hambly. In her 1982 Darwath trilogy, she writes about how wizards of several thousand years ago succeeded in tying information to the DNA of selected individuals. In the story, several people from 1980's California find themselves transported across the Void to another planet and the Realm of Darwath. They face a deadly species of queerly magical beings - the Dark - who destroyed civilization thousands of years ago. Everything that was made of paper (like books and records) were burned to stave off attacks by the Dark. Tying memories to a few suitable bloodlines was the only way to preserve a record of that period that would endure. "We have all talked of the heritable memories of the House of Dare," she went on... maybe the old wizards, the engineers who raised the Keep, knew that records do get lost, especially when, as you said, fire is the principal weapon." Gil's finger stabbed out like a sword. "They tied the memory to the bloodline and that was their record! A record that wouldn't get lost and couldn't be destroyed."